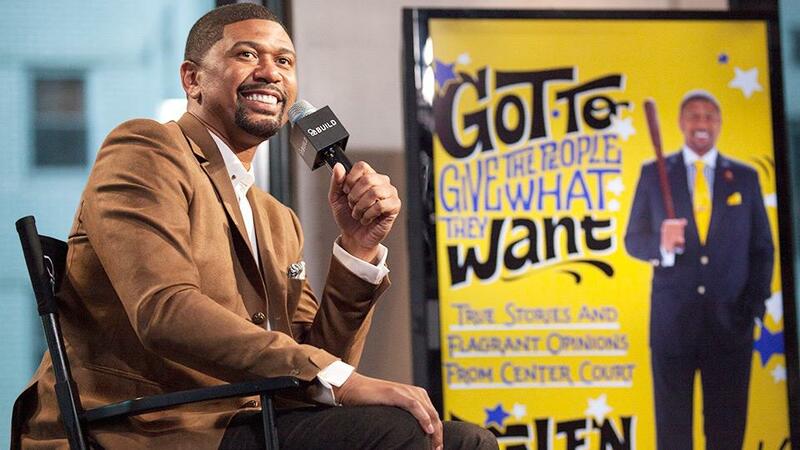 Jalen Rose, the former NBA all-star and ESPN commentator, released his book“Got to Give the People What They Want” on Tuesday. The autobiography chronicles Rose’s life from a student in Detroit, to his time with the “Fab Five” in Michigan, through his NBA career up to his current position at ESPN, where he stars on NBA Countdown and co-hosts a new radio show with David Jacoby. The book features many wild stories from Rose’s life—near-death experiences, his relationship with Chris Webber, trying to meet his biological father—all told in the distinctive voice fans of Rose will immediately recognize from his podcast. On Wednesday, Rose was kind enough to sit down with SI.com and answer questions about his many walks of life. SI.com: In your book, you discuss how growing up in Detroit and events like your father’s funeral impacted your life. How did the birth of your daughters and becoming a dad impact you? Jalen Rose: There are different phases of your life, it’s the phase when you’re 16 and you get your license and you get a little more freedom from your parents. Then the phase when you’re 18, and you’re probably in college and it’s the first time you don’t have a curfew, and then it’s the phase where you have to be an adult and be a professional. And the ultimate phase happens mid-to-late 20s to 30s, when all of the bills start to be in your name, that’s when your life changes. And also if and when you start to have a family, or have kids. I started having kids, it changes your perspective. It gives you a sense of responsibility you didn’t even know you could have, that you’re living for someone else. You’re responsible for not only helping create this young person, but shaping and molding. It can be nerve-racking, it’s the toughest job. That’s why I love my mom and grandmother so much, because they did an amazing job. And that’s why I dedicated the book to them. SI.com: You started your own charter school in Detroit. Why was education specifically important to you as a way to give back? Rose: For me, it’s how can I give back and influence in a way that is going to be long standing. Through education, to me there was no doubt that was the remedy. Through my foundation, I was already influencing via scholarship five public school kids for nine years. I also have a scholarship endowment at University of Michigan that’s graduated two students. Starting JRLA (Jalen Rose Leadership Academy) was just really a graduation of that mission. Living in a city like Detroit, when we were prosperous we had a population of 1.8 million people. Now we have 700,000. We’re trying to do what we can to come back to that thriving city. And I felt like my influence, because at the time we were opening jails but closing schools, it just gave me the courage to say I can do more to make a difference. The school is not just about educating those young kids. It’s also about life skills, social skills, etiquette, decision making, problem solving. Those life skills they’re going need if they’re going to be successful. SI.com: Your book discusses how you had confidence at a young age you would make it to the NBA. Did you ever have a moment where your confidence was shaken? Rose: I say this with all humility: I always had irrational confidence. I always felt like I was. I tell a story in the book when I thought I was Steve Austin, The Six Million Dollar Man. Been watching a lot of wrestling, outside in the winter, in Detroit, still water in the pool, with my older cousin who’s now a principal, I decide my confidence is going to help me jump across the pool. I go bounce off the fence to get a running start, and I think I’m going to jump across the pool. [Jalen landed in the middle and quickly began sinking.] Luckily for me, she didn’t jump in too or we’d both be dead. ​SI.com: You played in an infamous game during college when the opposing fans were chanting “crackhouse” after an incident at a friend’s house was publicized. How would you describe your emotions during that moment? Rose: That’s when you have to have a bunker, foxhole type mentality. That really tests your character and your toughness. People see celebrities or public figures or those that are successful in whatever genre of life, but they underestimate we all have to overcome turbulence, we all have to respond to bad decisions. For me, my career high game at Michigan was the only game I didn’t start. I started 104 games, the only game I didn’t start, that’s the game I had my career high. I always felt like I was somebody if I really needed to dig deep down to respond, I was always able to. That’s a trait I’m really fortunate to have. SI.com: What’s the most money you’ve seen someone spend during one night of partying? ​Rose: Oh. Oh man. [Long pause] And by the way, I’m not hesitating because I can’t think of a day, I’m hesitating to actually give you the day, and the answer. Probably $50,000? One of the craziest things about going out, and as you grow older you realize it’s highway robbery, is first and foremost, you’re reserving a place to sit, a booth. Hey, closer to the dance floor, get a better view of the club. Well, you’re paying $2,000 for that. And then you’re paying a $1,000, $1,500 for a bottle that costs $40-50 from the packing store. So you’re up to 10 already. All these people sitting around the table, they’re ordering, eating and drinking stuff, the type of stuff they wouldn’t be doing if they were paying for it. And before you know it the bill gets crazy. I’ve been a part and participated in more of those days than I can count. But the day I think it was really crazy, I’d say probably $50,000. SI.com: Can you stop someone when they’re spending so much or do you let them do their thing? SI.com: Do you feel totally welcome at Michigan after the sanctions because of the Fab Five? Rose: I’m 1000% welcome. Not only am I an alum and a former player, I’m also a donor. I’ve had multiple kids graduate from Michigan. When there was a separation happening, I was still getting updates like any donor would get because I have multiple relationships with the school. So whether its John Beilein or his coaching staff, or the university all the way at the top, I have a great relationship with the school and I have no hard feelings toward anything that happened in the past. Rose: The coolest thing about Larry Bird is that he never touched the clipboard. Think about it, you’ve never seen a coach that didn’t touch the clipboard. He was like E.F. Hutton for the team. While people know he was a famous trash talker, away from the court he was more introverted, he was more calculated. And so I would always be the kind of person that would try to get Larry to talk, or to get Larry to laugh, “Oh, here you go coach shoot that!” That was kind of my role with him, because I appreciated and loved him so much, but that was also my role with the team. So one of the best things he did for me, was as soon he got the job, he was like, “I’m going to turn that guy into a player.” He gave me a bigger role. I made another sacrifice that normally four-year players that were lottery picks don’t make, I actually went and played in Summer League in Orlando. Just to show Larry I appreciated him and his belief in me. SI.com: How are you enjoying doing a daily radio show? ​​Rose: It’s wonderful. We take pride in being different, looking different, sounding different, but still being ourselves. Engaging in sports but knowing sports is lifestyle, politics, fashion, and we’re able to touch all of those things. We’re able to get through a lot of runs, and we take a lot of time to create. When we’re doing an NCAA topic, and it’s SMU and they’re having academic allegations and I’m like, it’s kind of like when Doughboy shows up on campus, “We got a problem here? We got a problem here?” Like those are the kind of things that aren’t happening in national radio. There are a few more twists to the show we’re going to bring, but I have to let this initial cycle where everybody’s watching us kind of play out. But I’m really excited about the success of the podcast. Now it being a radio show, it’s important for us to still feed that audience. We’re going to take the time to still feed it as a podcast. SI.com: I know you’re well connected with [Michigan alum and Miami Dolphins owner] Stephen Ross. You have a Detroit connection with Ndamukong Suh. Tell me what’s going on with the Dolphins. Rose: Well when you hear the coach told the defense to take it light on the quarterback in practice, that starts at the top. Now, Ndamukong will tell you, he’s my family, he know he need to play better. He knows he needs to be getting up the field, I don’t care what technique they’re running. I don’t care who’s standing on the sideline. That sense of urgency showed, by the way, Stephen made a change real quick. He paid a lot of people this summer, he said, “I expect to make the playoffs.” You should appreciate as a Dolphins [fan] that they’re gonna make moves to try to win. That’s what I said about my Pistons last year. Josh Smith was a high-paid player. They still bought him out. I’d rather have that than what I’ve seen from Philly the past few years. Or some of the rosters the Knicks have put on the floor.